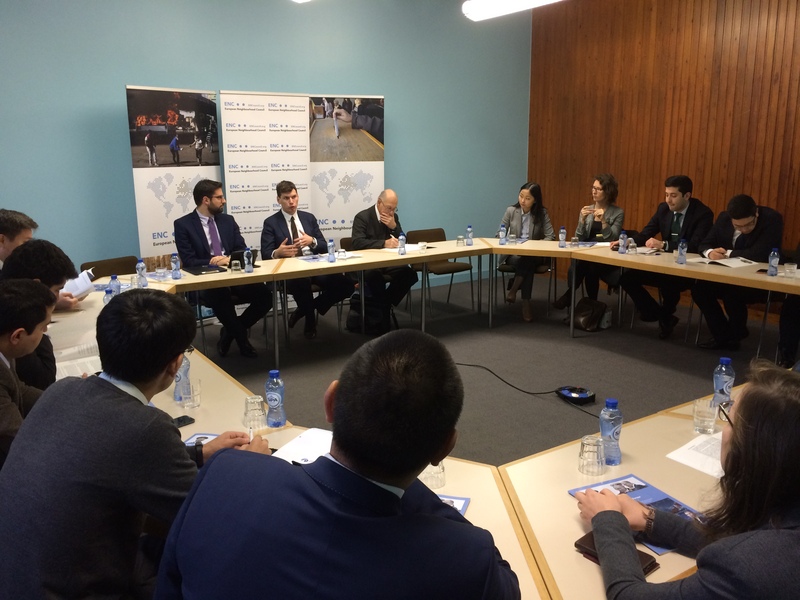 For the second year running, European Neighbourhood Council (ENC) – together with the Clingendael Netherlands Institute of International Relations – hosted a young group of diplomats from Central Asia and Mongolia on the 8th of November at ENC head office in Brussels. The programme also included meetings with officials from the European Commission, the European External Action Service (EEAS) and NGO representatives working actively in Central Asia like ENC. One of the aims of this programme is to elevate regional cooperation and give the opportunity to junior diplomats to interact with experts from European civil society on how organisations deals with tensions between countries as this is a challenge for achieving cooperation in the Central Asia region and what kind of projects they are implementing in the region. The group consisted of twelve junior diplomats from Kazakhstan, Uzbekistan, Kyrgyzstan, Tajikistan, Turkmenistan and Mongolia. ENC’s Managing Director Samuel Doveri Vesterbye opened the training session, presenting ENC’s research activities and projects across the Wider European Neighbourhood, embracing also Accession Countries and Central Asia. In particular, he highlighted ENC’s horizontal structure, which gathers academics and expertise from most of Eurasia, Enlargement Countries, European Neighbourhood Policy Countries and North Africa. In his opening remarks, Mr. Doveri Vesterbye advocated that despite the fact that EU has the expertise in several areas; Central Asia has the possibility to increase cooperation. Therefore, it is crucial to strengthen the synergy and dialogue in the region. 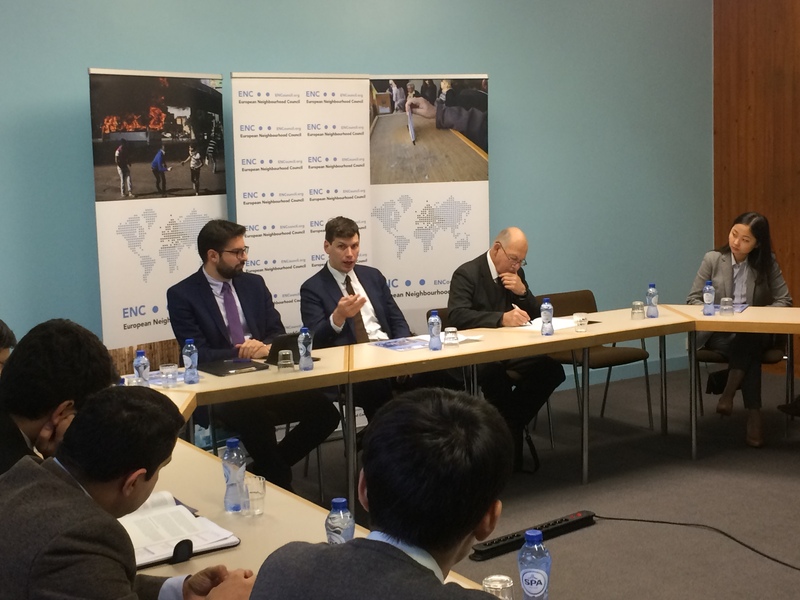 In the second part of the discussion, Andreas Marazis, Head Researcher for Eastern Europe and Eastern Partnership at ENC, identified the current stage and future perspectives of the EU-Central Asia relations. The EU is one of the key regional players in Central Asia and it adopts different political instruments to support the region’s development in several areas, namely democracy or nuclear safety. Yet, the Central Asian countries are still moving slowly in their democratisation process, leading to reluctance among the foreign/Western donors community to invest in the region. 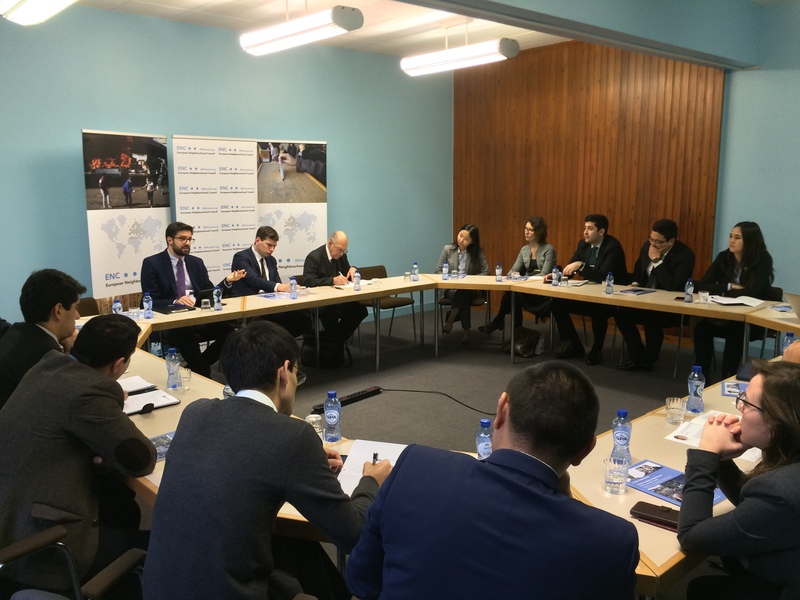 In order to overcome this impasse, Andreas Marazis highlighted the crucial role of the young generation as well as the need of a bottom-up model to take ownership and increase the cooperation with the EU, especially in shaping the new EU Strategy for Central Asia by the end of 2019. 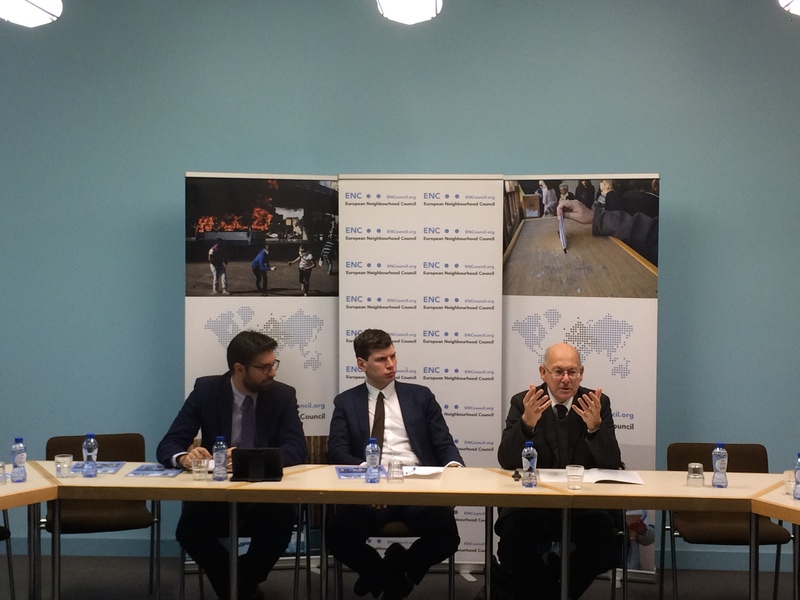 Among the distinguished speakers, Dr. Andrea Mogni, ENC external advisor and former senior policy coordinator and financial expert at the EEAS, highlighted during his presentation the differences among these countries in terms of demography, management of public affairs or partnership prospective. One of his main remarks was the need for Central Asia to develop deeper and stronger ties at the regional level. The region needs to develop inter-cooperation in various sectors, such as water, energy and electricity, highways, infrastructure, digitalisation and data exchange. This could lead to a productive and fruitful learning process of best practices, which could benefit the Central Asian states and attract Foreign Direct Investments (FDI). He referred to the financial instruments which Central Asian scholars have access to, such as the Horizon2020, which is the biggest EU-funded project (€70bn for 2014-20), covering scientific and societal matters among other things. Dr. Mogni also mentioned the role of thematic instruments covering issues related to food security, water management and migration. He also highlighted the European Investment Bank (EIB) and the European Bank for Reconstruction and Development’s (EBRD) role in financing big infrastructure projects supporting the countries in their development process. 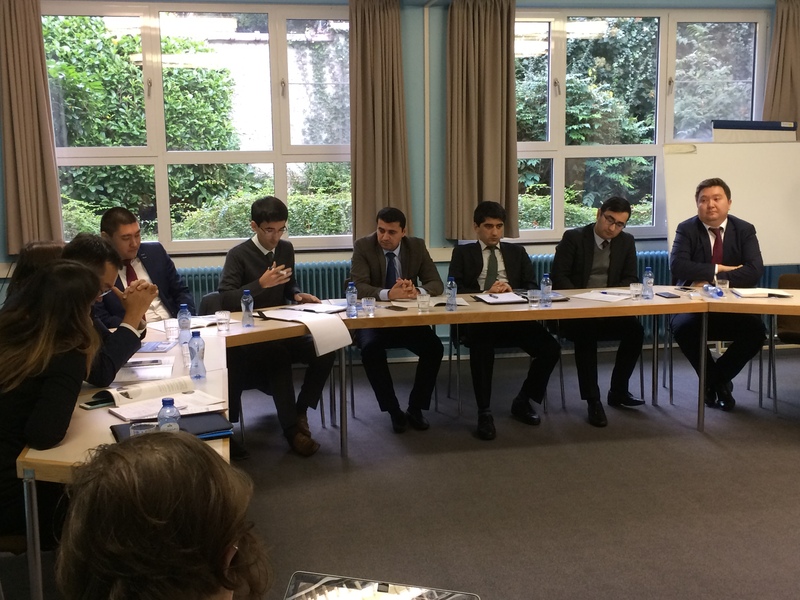 The Training Session for junior diplomats is also part of ENC’s 2018 European Diplomatic Training Program, in which various speakers, including Dr. Mogni, teach diplomats in EU affairs, financial instruments and decision-making.